Travel by postcards and letters. : A Happy New Year!/明けましておめでとうございます! Most of Nengajo have the design of the Chinese zodiac sign of the New Year (see here for more info), and the above my Nengajo has the design of a snake as 2013 is the Year of the Snake. The Chinese zodiac sign has a cycle of 12 years, each year represented by an animal (Rat, Ox, Tiger, Rabbit, Dragon, Snake, Horse, Sheep, Monkey (I was born in this year), Rooster, Dog and Boar). why do you write A happy new year?? just write happy new year. I don't think I want to be a mail(wo)man on the 1st of January in Japan. How are they delivering the mail? On bicycles, on foot,...? Hahaha. Me neither. lol The mail(wo)man usually deliver mails by a motorcycle, but during the winter holidays (from late Dec. to early Jan.), I often see young boys like high school student delivering mails by bicycle probably for their part-time job. That seems to be a hard job because I don't think their bicycle is electric bicycle like your mailman! Happy New Year / Akemashite Omdedetou Gozaimasu! 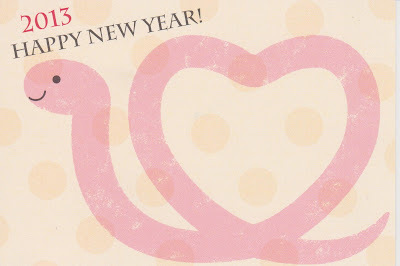 I hope 2013 will be a wonderful year for you.